The city of Dnepropetrovsk (pronounced Dnipropetrovs�k in Ukrainian) is situated on the river Dnieper (Dnepr or Dnipro) in the Central Ukraine. Population is 1.2 million. Large and beautiful, it is the main city of Central-East Ukraine. This constant fortress settlement has existed since the middle of the 16th century. The new city was founded in 1776 by the Russian duke, Potemkin by order of Catherine II, Empress of the Russian Empire and called Yekaterinoslav from 1776 to 1926. During 1918 the city�s name was Sicheslav (The Glory for Sich�/Fortress of Cossacks). Dnepropetrovsk has been the major center of the steel industry from the beginning of the 20th century until the present. It has also been dominant in the aerospace industry since the 1950s. Today the city is the main trade and industrial center of East Ukraine. 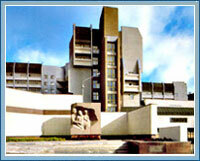 There are 11 universities, academies and institutes in Dnepropetrovsk. The construction of the Metro (underground subway) for the city was completed in late 1995. Dnepropetrovsk also has an international airport with direct lines from Vienna, Frankfurt on Maine, Istanbul, Tel Aviv, Moscow, etc.